Akilisi Pohiva, the allegedly Marxist leader of the Tongan "Democracy Movement" has been arrested in connection with last November's rioting and arson in Nuku'alofoa. At the time, several commentators blamed the "Democracy Movement" for the destruction. Some alleged that it was not just politically motivated, but that commercial jealousy also played a role. 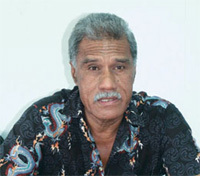 ‘Akilisi Pohiva, controversial leader of Tonga's pro-democracy movement and No. 1 People’s Representative to Parliament, was arrested yesterday at 5pm on charges relating to 16/11 - “Black Thursday”. Pohiva is the highest profile leader arrested so far, accused of being one of the ringleaders of the riot that led to the burning of downtown Nuku’alofa on November 16, 2006. His friend and No. 2 People’s Representative, ‘Isileli Pulu, is still in police custody, charged with sedition and abetting public disorder. He may also face other charges as the investigation continues. ‘Ofa Simiki, of OSB businesses, a well-known businesswoman and ardent supporter of Pohiva, has been released on bail. She faces sedition charges as well as charges of abetting arson. These high profile arrests have been expected for some time, as police have assured the public that sooner or later their investigations will close in on the alleged ringleaders of 16/11.